Hello, Altenew fans. 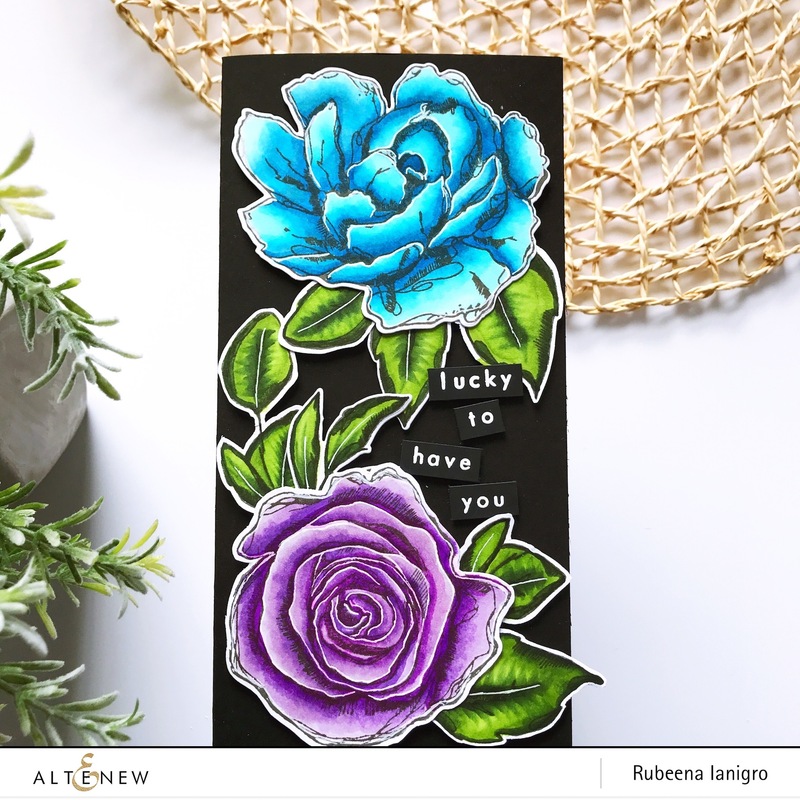 Rubeena here with a card using Inked Rose and Inked Flora stamp sets. These sets are so gorgeous! I paired them up since they have a similar sketchy design. I stamped all the images on smooth white cardstock with Lava Rock Crisp Dye Ink. I used the Artist Markers Set A and Set B to color the images. I used all four color shades for every marker (except for the leaves). Then I added some lines with a white gel pen to make the images pop. Then I die-cut the images with the coordinating dies. I created a folded black card base that was 4.25″ wide and 7.5″ long and then I mounted the images with foam tape. 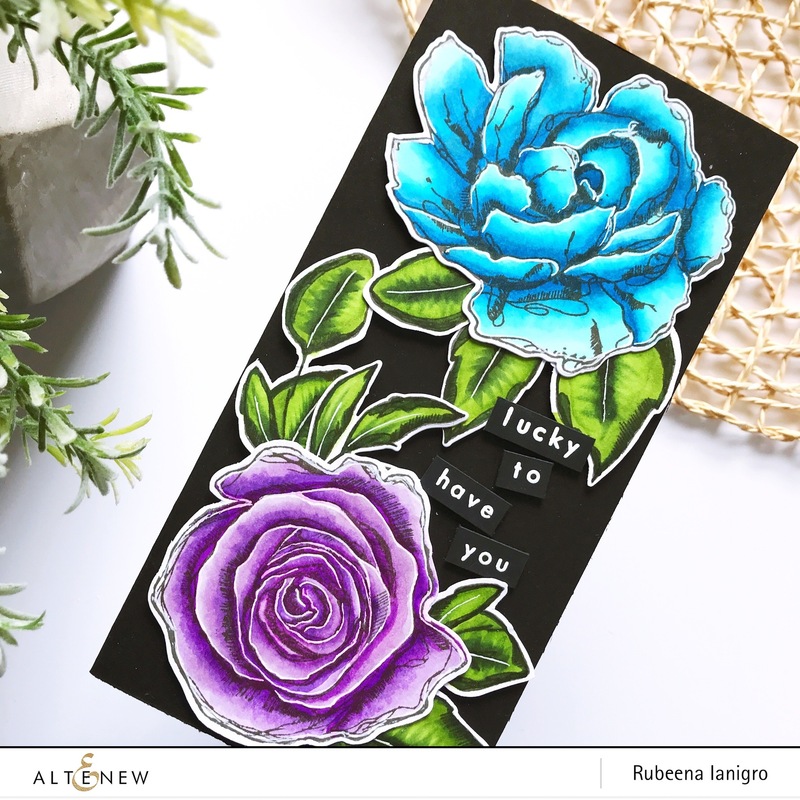 For the sentiment, I stamped “lucky to have you” from Leaf Medallion Stamp Set with clear embossing ink on black cardstock. I heat-embossed it with white embossing powder. Finally, I trimmed down the words and mounted them between the flowers with foam tape. I hope this inspires you to create. Thanks so much for visiting today! Fabulous card. Love the tall shape, and the bold colours on the black base card – gorgeous! Loved seeing these two paired together!! And your color choices are always spot on, Rubeena!! Gorgeous! Beautiful flowers and coloring. I love them. Love the tall shape and placement of the sentiment. Gorgeous card, I love the bright roses against the black card base! Both flowers are gorgeous Rubeena, the stamps sets with the flowers are great. Thank you for sharing. Gorgeous card! The black background really enhances the beautiful flowers! Your flowers are just beautiful, and I love them mounted on the black. Perfect.